Residents of nearby makeshift villages gather as a U.S. Air Force Reserve crew based at Travis Air Force Base begins unloading water purification equipment in Goma, Zaire. The photo was taken in the summer of 1994 by Keith Michaud, a journalist covering the mission. Residents of nearby makeshift villages gather as the C-5 Galaxy is unloaded. The transport was based at Travis Air Force Base in Northern California. Photo by Keith Michaud. A C-5A Galaxy transport plane from Travis Air Force base delivered much-needed water purification equipment to Zaire on Tuesday, helping Rwandan refugees battle a deadly outbreak of cholera. By Wednesday, the equipment was working and delivering purified lake water to thousands of refugees in camps near the border town of Goma. The relief effort, however, was hampered by a lack of trucks to deliver water. United Nations officials were able to round up only two leaking, half-busted tanker trucks. U.N. organizers, overwhelmed by the crisis, said they were searching for tanker trucks in Zaire and shipping in about 10 tankers from Uganda and Croatia, but were able to rent only a few from gasoline shipping companies Wednesday. The Travis transport, manned by reserves from the 349the Airlift Mobility Wing, traveled for nearly 24 hours with at least three mid-air refuelings to deliver the water purification equipment and the seven-man crew from Portable Water Supply Systems. The Redwood City company set up an above-ground water system to pump 100,200 gallons of lake water every minute to eight water purifiers. Company owner Frank Blackburn said he and his crew will use two miles of hose to bring water from Lake Kibu, near Goma. Water there has been fouled by dead bodies and human excrement, worsening the cholera epidemic. Blackburn, a former San Francisco Fire Department assistant chief with 34 years experience in firefighting and disaster planning, said his company helped provide water during the Loma Prieta earthquake and the Oakland Hills firestorm. “This one is different because there’s a lot of people dying over here,” he said, aboard the C-5A. Blackburn’s son, Matthew, is with the crew. “For him, it’s a workshop,” Blackburn said of his son, a University of California, Davis, student studying international relations. Hundreds of refugees, French airmen, and U.N. representatives greeted the transport when it landed at the now-busy airport in Goma. Children scattered from the runway as the huge jet touched down. Not far away from where the plane was unloaded were two bodies and piles of rocks some said where graves. A member of the U.S. military assessment team said bodies also were outside the airport entrance, mostly because the airport is between the contaminated lake and a refugee camp. Roussel and other French airmen have been in Zaire for a month. Roussel said the relief effort was a good thing. “It’s difficult, but a beautiful mission because we do it for them,” said Roussel, pointing to the hundreds of refugees gathering to see the transport. As the crew finished unloading equipment, a funeral procession moved from nearby huts, along the edge of the runway, behind palm trees. Children begged for money, business cards, to have their photograph taken, or anything American. Shields said the local government and humanitarian groups were cooperating with the advance assessment team. He said one of the early problems was getting aircraft unloaded at the airport; at first planes were unloaded by hand. U.S. Air Force Capt. David Burgess was helping deliver Red Cross supplies to Nairobi, Kenya, when he asked if someone was needed to assess the airport in Goma. That was seven days ago. After unloading the C-5A with a forklift, Burgess estimated he had unloaded 300 tons during the previous 30 hours from all sorts of aircraft arriving from different countries. A tired Burgess said, “I’ve seen the refugee camps. I’ve seen the mass graves. I’ve seen funeral processions like the one we just saw. We need more help here. Two children from the nearby makeshift villages ham it up for a couple of journalists from the United States. In the background are what locals said were burial mounds. The children were playing on the mounds. Photo by Keith Michaud. A funeral procession makes it way not far from a C-5 Galaxy transport jet being unloaded of water purification equipment at the Goma, Zaire, airstrip in the summer of 1994. Photo by Keith Michaud. The images of Goma, Zaire, go beyond frightening. The go beyond haunting. 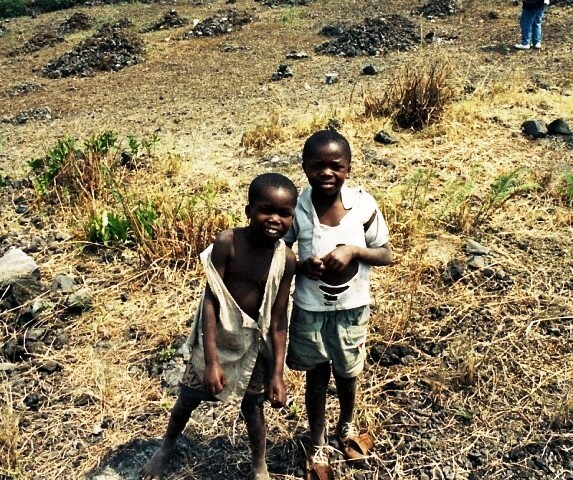 On a hill overlooking the airstrip, two small bodies lay side-by-side, their faces and most of their thin bodies covered with a cloth. A small child – perhaps 5 years old – sat on one of the nearby rock piles in a makeshift graveyard with graves of all sizes, from adult to small child. 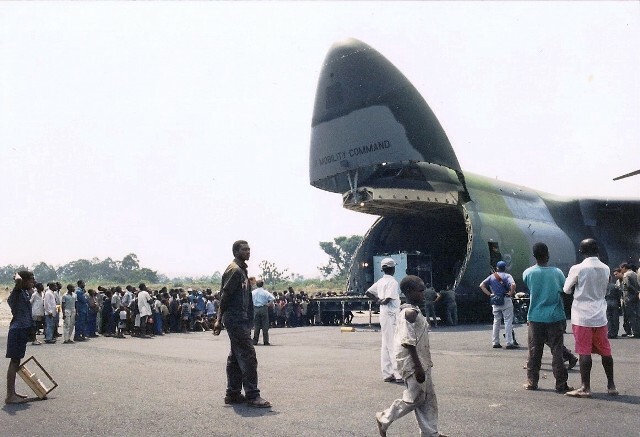 As the first of the U.S. Air Force transports finished unloading water purification equipment a week ago for thousands of Rwandans dying from cholera and other diseases, a funeral procession came from behind a dirt berm nearly concealing shanty huts. The procession, complete with 100 or more singing mourners, made its way around one end of the runway where the C-5A Galaxy jet from Travis Air Base in Fairfield was being unloaded. It then moved into a grove of nearby palm trees. Despite the muggy haze, Mount Kilimanjaro could be seen from miles away, a backdrop to the airport, the camps and the horror. Relief workers said bodies of more dead were along the road just outside the airport gate, the same road used by refugees to travel from the camps to Lake Kivu, which is contaminated by dead bodies and human waste. These, by far, are not the worst scenes from the tragedy that has come from a Rwandan civil war that has already killed hundreds of thousands and left tens of thousands dying in refugee camps. But each image of death, each image of suffering, each image of the atrocities in Rwanda and surrounding countries adds to a pile of horrific woes stacked far higher than stones piled on top of the graves. Air Force Capt. David Burgess arrived in Goma, Zaire, five days before the Travis jet. Flying humanitarian aid to Nairobi, Kenya, Burgess volunteered to fly to the tiny airstrip to assess the airport for the expected flights bring aid to the ravaged countries. I’ve seen the refugee camps. I’ve seen the mass graves. I’ve seen funeral processions like the one we just saw. We need more help here,” said Burgess, weary from nearly single-handedly unloading transport aircraft early last week with a lone forklift. Other transports, he said, were unloaded by hand. “The bodies stacked like cordwood. … It really gets to you,” he added. 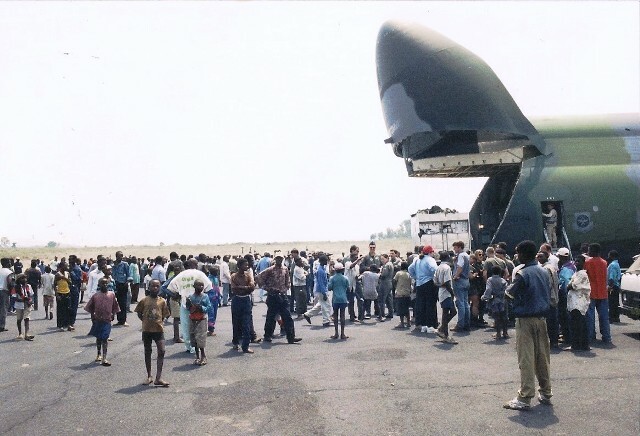 Hundreds of refugees gathered around the Travis jet, making it difficult for Burgess to unload. The onlookers, mostly small boys and men, crowded in on the jet, its Air Force reserve crew and media representatives accompanying the humanitarian mission. The men, speaking broken English and passable French, asked for help, any help. The mostly begged for money. The children also begged for money, but some were happy just to have their photograph taken. Some children wearing little more than rags walked arm-in-arm, apparently with no surviving adults to supervise them. It is estimated that some 2 million Rwandans left their homes and their crops to flee to Zaire, and hundreds of thousands of others fled to Tanzania, Burundi and Uganda. By the end of the week, many refugees began returning to their homes despite the continued threat of violence there. Relief workers were trying to set up food stations along the road back to Rwanda to encourage refugees to return home and away from the deadly camps. The suffering prompted a U.S.-led rescue effort on a massive scale. The U.S. military called upon reserves – its “weekend warriors” – for a peaceful mission. The C-5A Galaxy carrying water purification equipment from a Redwood City company, Portable Water Supply System, was flown nearly 24 hours straight from Travis Air Force Base to the airport in Goma, Zaire. The flight, because of its length, required twice the normal crew from the 349th Air Mobility Wing and three mid-air refuelings. Now flights are taking off from military bases in Europe on their way to Africa. One of the pilots, Lt. Col. John Jackson of Benicia, has been in the reserves at Travis the past 15 years, with 10 years active duty before that. Jackson has flown scores of humanitarian and emergency missions, but delivering the water purification equipment had a special meaning. Portable Water Supply System was up and running within 24 hours, helping provide hundreds of thousands of gallons of drinking water. With more equipment expected, the water was but a fraction of what was needed and relief workers were unable to get much of the water to the refugees because of leaky tankers. Jackson’s co-pilot, 1st Lt. Greg Chrisman of Burlingame said, “From a personal level, it’s pretty easy to read a newspaper or watch TV and see what’s happening. … I don’t even think we can imagine the severity of the situation. “When they called and said they needed people, that was part of my commitment (to the Reserves). I wanted to go,” said Chrisman, who flies for Southwest Airlines. Jackson and Chrisman over the years have flown missions to Desert Storm and Somalia, and have helped relief efforts after hurricanes and other natural disasters. Tech. Sgt. Alice Munoz, of Vacaville, has more than 14 years in active and reserve duty. A correctional officer at California State Prison, Solano in Vacaville, Munoz is a flight engineer. Except for the flight surgeon, she was the only woman on the reserve crew flying the equipment to Goma. “I’m very patriotic,” said Munoz, “so whatever the Air Force has for me, I’m willing to help out. Munoz was not the only crew member from Vacaville. Lt. Col. Phillip P. Blackburn, Mast Sgt. Wendell K. Asato, and Staff Sgt. Roderick J. Rodda, all of Vacaville, were also on the crew, with Staff Sgt. Robert T. Selmer of Fairfield. The crew members mentioned that their employers willingly allowed them to take off time for the mission, mostly because of the images shown over the past weeks. It’s hard to shake the things you see in Goma, Zaire. A week back from the trip with an Air Force Reserve flight to a tiny airstrip to deliver water purification equipment, I still don’t sleep as well, eat as well or think as well as I did before visiting that place. Maybe it’s jet lag. Maybe it’s the malaria pills I must take for another couple of weeks. Maybe it’s just what I saw there. Even though it was just an African airport and not the disease plagued refugee camps, it changed my perspective on the world and what’s important. We Americans are quick – too quick – to complain about the very little of things. We complain if we don’t have clean underwear. We complain if a flight home is not on time. We complain about being a couple bucks sort. What do Rwandan refugees have to complain about? They have life and death. Lately, they’ve had mostly death. When all the bodies are totaled, there could be 750,000 to 1 million dead between the civil war in Rwanda and the disease in refugee camps in neighboring countries. Many of those camps are around Goma. There’s a surreal quality to the Goma airstrip. 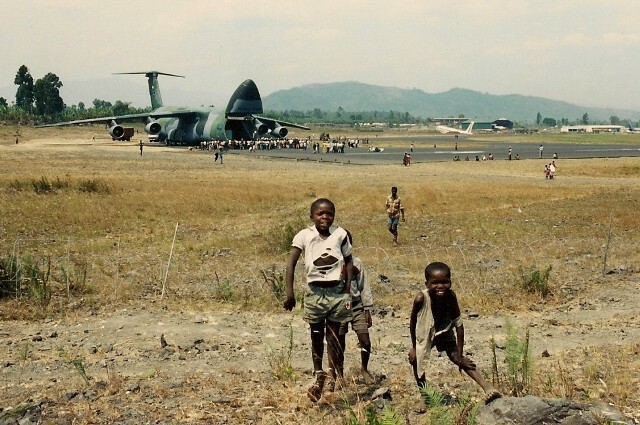 As the C-5A Galaxy from Travis Air Force Base came in low for the landing, young children scurried out of the jet’s path, many knocked over by the wash. It’s a little game they play in Goma. A fence of rolled barbed wire goes around a least part of the airfield. But there are large holes in the fence and it’s fairly easy for refugees camped not far away to make it to the end of the runway to see the big jet as it is being unloaded. Americans complain about being overweight and being unable to stick to diets. There were no overweight people at the Goma airstrip. There were a few bloated stomachs, though. The airstrip there is in a bit of a basin with patches of green and lush hills nearby. Mount Kilimanjaro from miles away peers down through the thick, hazy African sky. Just beyond the rolled barbed wire were two thin bodies, barely covered with a cloth. Refugees from nearby shanty camps walked by with bundles heaped high on their heads; most barely looked at the bodies. To them, the bodies were just two more of so many. And just beyond were more signs of death in Goma: stones piled up for graves of all sizes. Children play among the piled stones. As the crew finished unloading the huge jet, a funeral procession went by. More death. It’s not difficult to imagine the bodies. U.S. and French military officers talked about the road just outside the airport. Men hardened by training, expectations and experience, they still become choked up when they talked about bodies stacked like cordwood. But among the images of death, there are still those glimmers of hope. The water purification equipment was up and running within 24 hours. It was enough to give only a small portion of the refugees clean water, but it was a start. 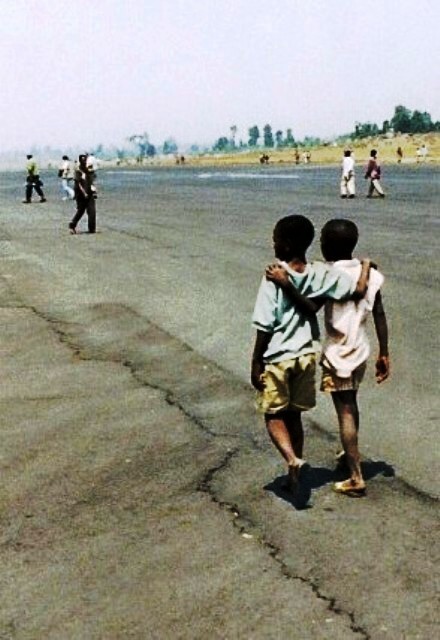 Two children walk down the runway at the Goma, Zaire, airstrip in the summer of 1994. And children still play in Africa. They still walk arm-in-arm. They still mug it up for a camera. Children die in the refugee camps, but children are children and they play until they are too ill to play. It’s not the Africa I saw as a kid in Tarzan movies. It’s an Africa that likely will continue tearing itself apart with tribal wars – wars that will continue to leave hundreds of thousands of people vulnerable. News stories compared the death and living conditions to hell and the first days of the Apocalypse. That seems close to the truth. The author was a staff writer for The Reporter when this column was published. Maine ranks 29th in national obesity study – Bangor Daily News. FREEPORT – The field was freshly mowed but no one had collected the clumps of grass clippings. Mosquitoes swarmed as Mark Rohman paced off the diamond to help set the bases. Ballists loosened their arms while rooters spread blankets or placed chairs for good sight lines. Troubadors strolled and youngsters darted. Vendors prepared to sell beer, kettle corn, ice cream and hot dogs. Umpire Jeff Peart, so dignified in a black frock coat, dazzling white shirt and gray, bushy beard, called the two teams together Sunday. It was time to play old-time baseball, to relive the America of 150 years ago. The men who are the Essex Base Ball Club of Danvers, Mass., took the field, 100 yards or so from the simple white house on Pettengill Farm. The players of the Dirigo Vintage Base Ball Club of Augusta — or ballists, as they were called in the 1860s — hefted long, narrow bats and waited their turn to strike. “I love baseball and I love history,” said Rohman, a Civil War re-enactor. He organized the Dirigo side five years ago after researching everything from the rules of the period, the uniforms and the terminology. Click on the link for the rest of this story by Steve Solloway in the Portland Press Herald. Finding truck moves slaying probe forward – Bangor Daily News. Truck linked to triple slaying found in Weston – Bangor Daily News. Offshore wind grant could reach UMaine | The Portland Press Herald / Maine Sunday Telegram. Three different people in the span of an hour have brought their dogs into the coffeehouse, including a Chihuahua with the heart of a Rottweiler. I love dogs, yes, I do. But not with my coffee. This is a truck similar to the one Maine State Police are searching for in connection with a triple homicide in southern Aroostook County, Maine. AMITY, Maine — Tips from the public could greatly assist investigators in solving a triple homicide at a trailer on U.S. Route 1 in which two men and a 10-year-old boy were stabbed to death, Maine State Police said Friday. After a late-morning meeting among detectives at the Houlton barracks, state police Lt. Gary Wright said public involvement could be “huge” in helping authorities solve the crimes. Evidence Response Team investigators continued on Friday to pore over the trailer where the bodies of Amity residents Jeffrey Ryan, 55, his son Jesse Ryan, 10, and Jason Dehahn, 30, were found at about 9:30 p.m. Wednesday. The homicides most likely occurred in the early morning hours Wednesday, state police said. The evidence response team at the scene on Friday appeared to collect several pieces of evidence from the driver’s side floor of a tan car Ryan owned that was parked outside of his trailer. Police have received more than two dozen telephone calls reporting sightings of a blue-and-silver 1989 Ford F-150 pickup truck with license plate 4155RY missing from the home, but none that have led to the pickup, Wright said. The truck has white-colored wheels in the front and silver in the back, and has orange running lights on top of the cab just above the windshield. 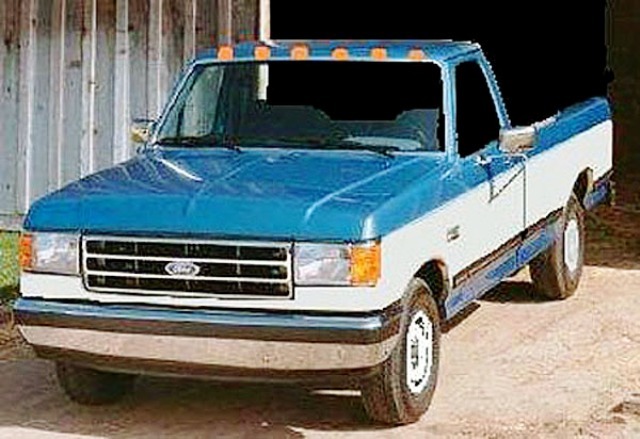 State police have posted a photo of a similar truck on the state of Maine and state police websites. Anyone who has seen the truck should call the Houlton barracks at 532-5400 or 911 on a cell phone. 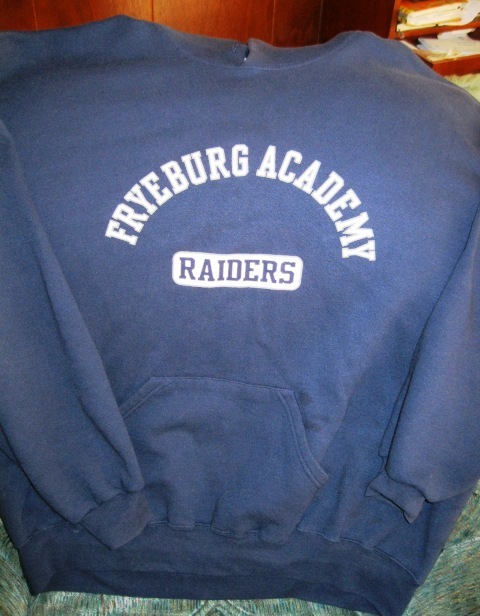 Click on the link for the rest of the story by Jen Lynds and Nick Sambides Jr. of the Bangor Daily News. There is raw video at this link of Maine State Police Lt. Gary Wright, but the sound quality is not great.